Description:- Whirling, twirling, musical fun is on the way with this exciting Playskool Musical Gear Centre! Your little one can push this button to activate the music and motion that will keep both his eyes and ears engaged. As he drops the ball onto the track, he’ll watch with delight as it falls down the tube and then spins at the bottom. He’ll love spinning the gears on the side to turn the friendly face around and around – and when he gets older, you can remove the gears so he can stack them and take his fun to ‘new heights’! The active play, twirling fun and happy music just goes on and on! 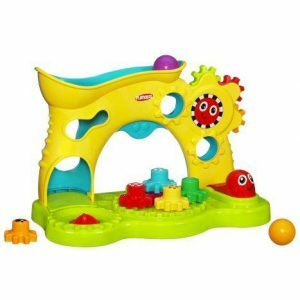 Set includes activity center base, ball arch, two balls, five gears and instructions. Review:- Both my little ones love this toy. My youngest usually plays with toys which are too old for him due to having a three year old brother, but he loved this toy. He plays with it all they time, building the gears up, pushing the ball through and playing the tune. There are so many things they can do with this, it really is a fantastic investment that they won’t get bored of. If only I could attach the balls to it some how, I’m forever looking for them under the couch but then it wouldn’t be as much fun for them would it. I would recommend this toy to anyone with a one year old upwards. It’s fantastic, so much for the little ones to do, see and hear.